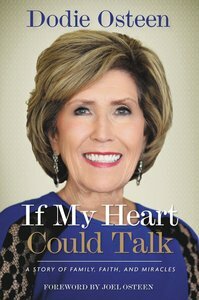 Dodie Osteen, mother of Joel Osteen, gives readers a personal account of her extraordinary life and shares what she has learned about love, faith, and family. As the wife of forty-four years to the late Pastor John Osteen, founder of Lakewood Church, Dodie Osteen stood as a wife, mother, and first lady of the church, even when life felt anything but steady. Today, she continues to stand by her son, Pastor Joel Osteen, and the rest of their family as they lead Lakewood. In this revealing memoir, Dodie shares that her path, though glorious, has not always been easy. She shows an intimate look at such life-altering experiences as contracting polio as a child, raising 5 children, battling cancer, and losing her husband, all with the beautiful heart and sense of humor she displays to thousands at Lakewood and nationwide at Night of Hope events. While recounting her journey, Dodie offers readers meaningful life lessons applicable to their own lives. About "If My Heart Could Talk"